The Ashmolean's Department of Eastern Art has long held a substantial collection of Buddhist sculptures, ritual objects and scroll-paintings from Nepal and Tibet. Some had belonged to the museum of the University's former Indian Institute (1897-1962), while others later came on loan from the Bodleian Library, from the gifts of the Tibetan scholar W.Y. Evans-Wentz. Many more formed part of the extensive loan collection, recently donated to the Museum, of the late E.M. Scratton. Most of these objects belonged to the later phases of Himalayan art (c.1750-1950), and relatively few to its earlier, formative periods. Through further purchases and gifts, however, a wide range of images and artefacts from the earliest periods of Himalayan sculpture and metalwork (c.700-1400) has also gradually been acquired. Many are outstanding works of art, while others are of rare and little-studied types. It was therefore decided to publish this catalogue devoted to the Museum's early Himalayan holdings, including a few objects held on long loan as promised gifts. Although they cannot be exhibited at present because of reconstruction work at the Museum until 2009, it is intended that virtually all of these remarkable objects will be on permanent display when our new Indian and Himalayan galleries reopen. 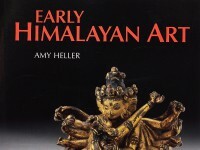 We are indebted to Amy Heller, a well-known specialist in Tibetan art and history, for writing this book for the Museum, and to David Gowers and his colleagues for their photographic work. We are above all grateful to Neil Kreitman for his generous support for this project and for his valued advice at each stage of its development.